This (the title) is what I told my husband mere minutes ago, after watching the new trailer for The Hunger Games: Mockingjay Part I. Even though I just re-read the entire Hunger Games trilogy earlier this year, seeing the trailer made me eager to do it again. I’ve got too much to read, dude. Now, this is a good problem to have. It’s just the kind of problem that I like. Not always easily solved, but it’s fun to try, anyway. There was a point in my life when I was disciplined enough to read every book in the house before buying anything new, but that was in 2007, and let’s be honest: a lot of good books have been published since then. We are a reading family. There’s me, of course, the crazy-avid reader. There’s my husband, who currently has three or four books that he’s reading. There’s my first grader, who gets an ice cream party at the end of the year if he reads 100 books, so we make sure to squeeze one in every night. And there’s even my two-year-old, who took an interest late in the game (compared to his elder brother, who was re-enacting his favorite books at 18 months) and wants a new book every time we go to our local bookstore’s story time. I particularly love reading with my kids, watching them absorb so much information and the excitement when they get a new book. They are quickly becoming like their mama, getting excited every time we take a trip to a library or bookstore. And if you follow my blog, you know that one of my biggest problems when it comes to books (aside from wanting to spend all of our money on them and then not having time to read them, in any case) is where to put them. When I ran out of room in our china-cabinet-turned-bookshelf, I started using the top of the piano. I stored large, hardback volumes in cabinets, and the little corner shelf in my bedroom was overflowing. I started looking for people who might want to borrow books, just so I could make more room. Then something wonderful happened. My grandfather’s widow finally decided she was tired of keeping his old bookcase kicking around in her garage. 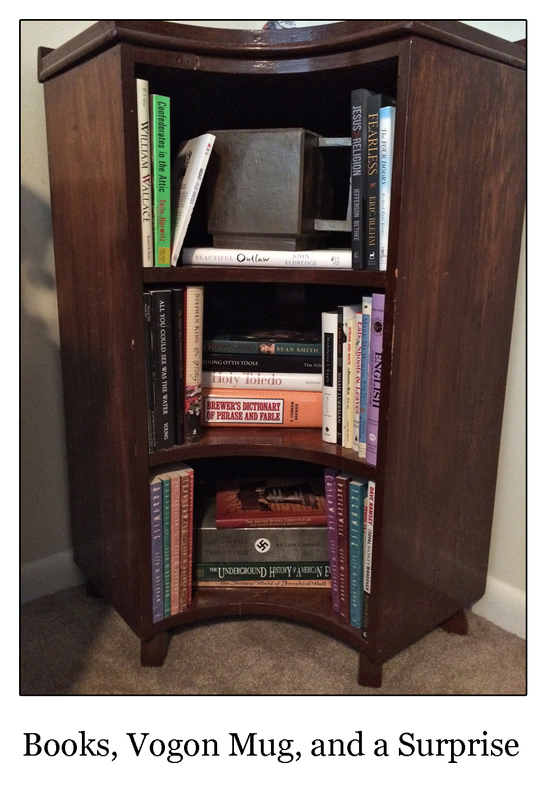 This isn’t some other piece of furniture that can be converted for book shelving purposes – it was made to hold books. My parents didn’t have room for it, so that meant that it could be mine – AAAALL MIIIIINE! If only I could find a place to put it. Now, you know that I would be cool with getting rid of our toys and even some furniture, as long as I still have a good chair to sit in. But since I don’t live alone (and I don’t want to any time soon), I have to consider the other people who live with me. We ended up scooting our little photo album shelf over a few feet and moving my mother’s lovely painting up, and – voilà! – instant bookcase space. What do you think? It’s a little banged up, but after all, it is antique. And to see all (well, not quite all, but most) of our books in one place makes me realize how many we have. Yikes, that’s a lot. But you know, there’s no such thing as too many books. 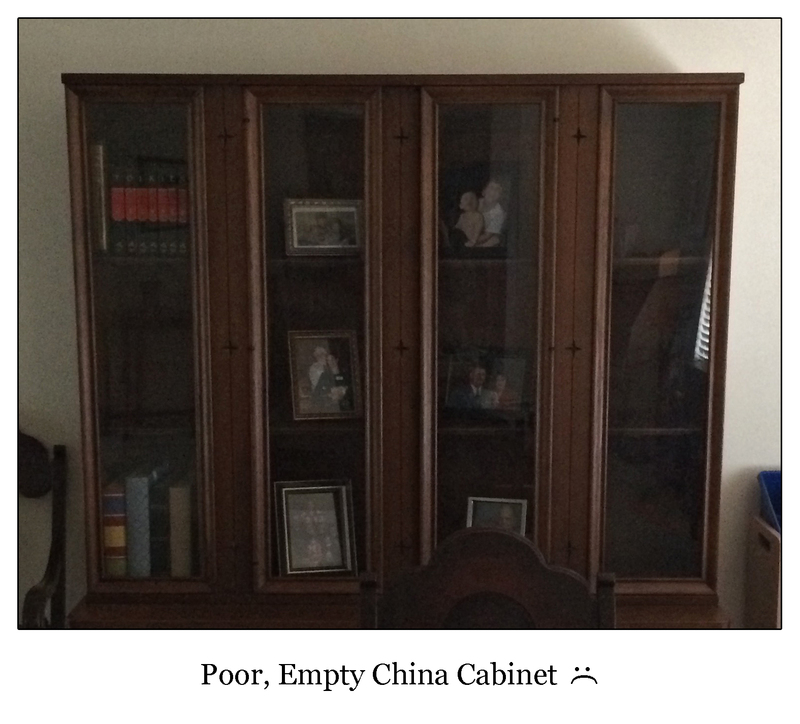 Look at our poor china cabinet. The only thing left in there is Tolkien. And photo albums. I put some in there to keep it from looking empty. Oh, and family photos. Hello, family. Love you. Just wish there were some more books behind you. Of course, as I told my husband, we might want to consider actually pulling our china out (wherever it is) and put it in the china cabinet. I mean, it has little display lights and everything. It would be a shame not to use it for its intended purpose. Okay, you know I’m just joking. The reason the china is packed up is because I do not intend to use it, but I do intend to buy more books. Oh yes. Picture me rubbing my hands together in glee. Which brings me to something amazing that happened this weekend. This is the kind of thing that happens to people in books and movies, but never to us. So here’s the cute little shelf in our bedroom. Now, it’s all non-fiction, but before the big bookcase, I had even more stuff crammed in here. So when I pulled those books out to sort them onto the new (to me) bookshelves, I decided I might as well dust while I was at it because, let’s be honest, it doesn’t happen very often. I pulled all the books out, and when I removed the ones to the right of the Vogon mug (yes, that is a Vogon mug you’re looking at on the top shelf, Hitchhiker fans), I saw some paper sticking out of one of the books we received last Christmas. And I began to have a horrible-slash-wonderful feeling. I pulled the paper out, and it was a sweet note from the relative who gave us said book. And in the note was a pile of money. I think, were I ten years older, I might have had a heart attack on the spot. I carried the note and the money into the living room, where my husband sat oblivious to this miracle. I showed him the money. I probably said some crazy stuff. I’m really not sure because I was in shock right then. Like I said, this kind of thing never happens to us. Maybe it’s time to start looking for agents again, if my luck continues like this. It did not take long for me to conclude that a good portion of this money needs to stimulate our local bookstore and help fill the poor, empty china cabinet shelves. You could say that this was meant to be. Bookshelves and dusting can lead to marvelous things. I still haven’t found more time in my day to read, but you know me: I like a challenge. And if you like morals, the moral to this story is that if someone gives you a book for a gift, open it up and make sure nothing’s lurking inside. And then, of course, add it to your book list. This entry was posted in Odds and Ends and tagged Books, Reading. Never too many books – so true! Isn’t a wonderful as a reader (and writer) that your children also share your love? That’s how I feel. If my kids didn’t like books, I’d be rather bereft! I love your new bookcase, but now I’m intrigued by the painting above it. I’d love to see the rest of it. Does your mom still paint, or is she just too darn busy with other things? I hope she gets to do creative things once in a while, just for herself. I agree that it’s wonderful when your kids start to appreciate books. 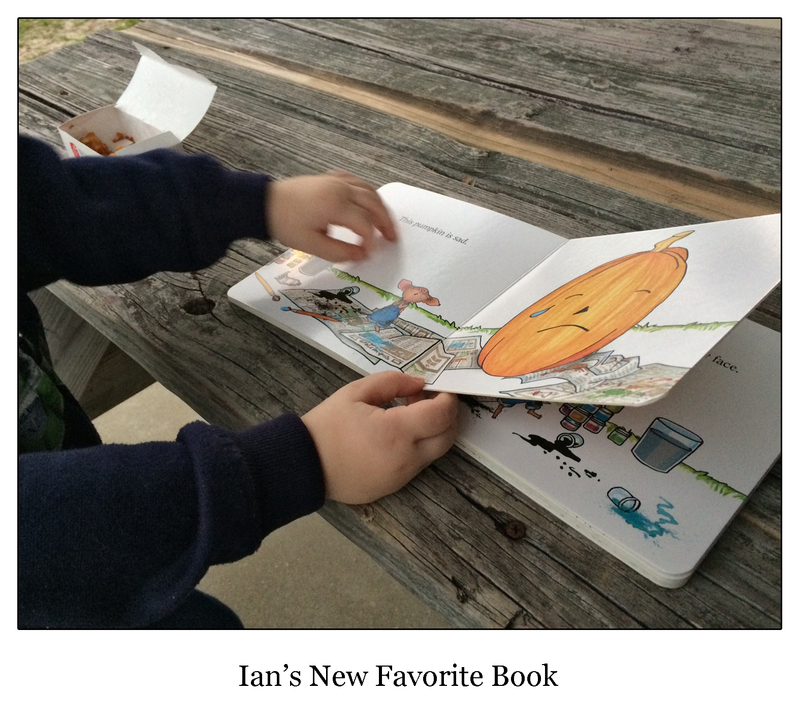 I’m thrilled that my grandsons all love books, and that the oldest one is now an avid reader. It took him a while to get the hang of reading, but once it clicked, he turned into a bookaholic, just like the rest of us. 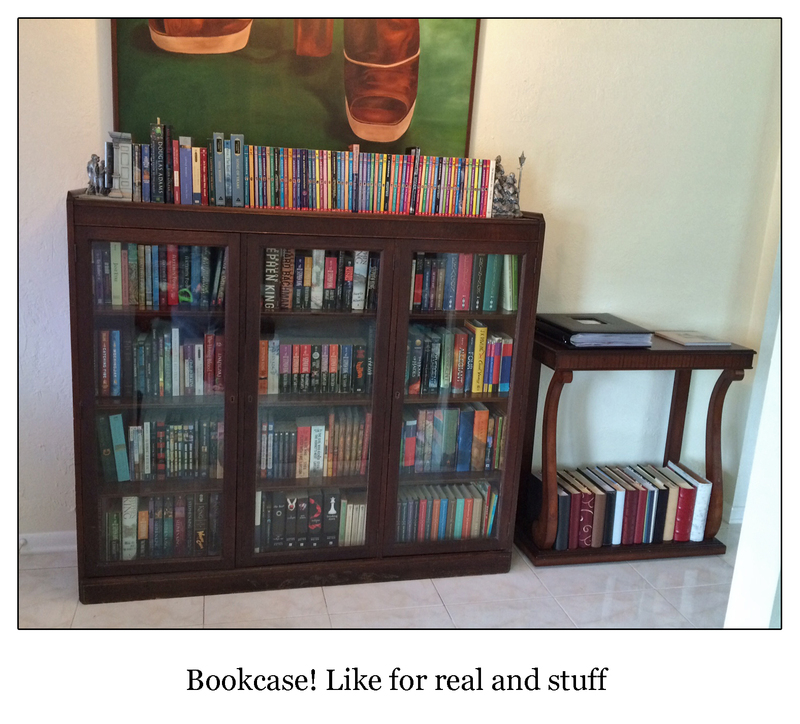 A gorgeous new bookcase, kids who love books and found money — you must be feeling rich indeed! It was a great weekend, for sure! The painting is one my mom did in college. I always loved it, and they framed it for me as a surprise about nine years ago. She did a pencil portrait from my wedding about seven years ago, but she’s since injured her thumb, and it’s painful for her to do a lot with it.